Sacoa started as a single FEC in Argentina over 50 years ago and today owns and operates more than 20 locations in South America. In the early 1990s, Sacoa began developing the PlayCard System for its own use but soon released it to the international market, beginning with Dave & Buster’s locations across the USA. 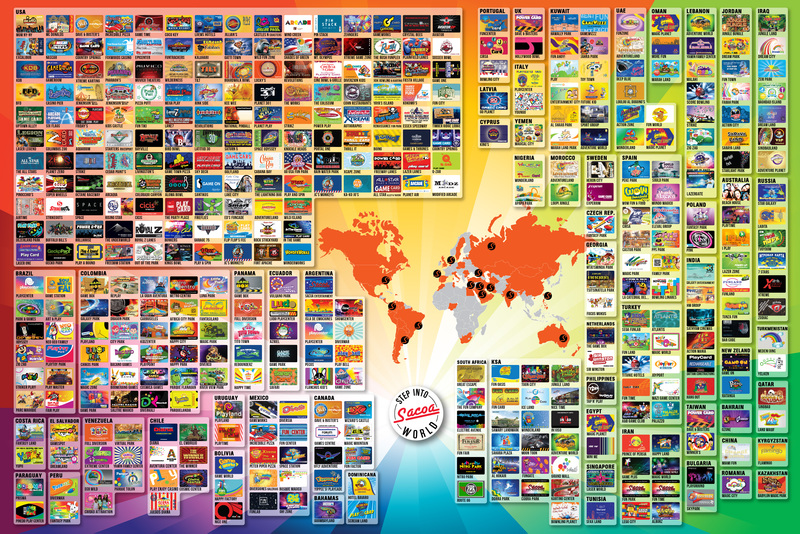 Since then, the PlayCard system has been installed in over 1,000 locations and over 50 countries throughout the world. The PlayCard System evolved from simply managing game play and selling or recharging debit cards to being a fully integrated, complete solution for all services, including food and beverage, amusements, attractions and rides, bowling lanes, midway games and even retail merchandise. “Our system truly manages all aspects of your business, such as redemption, party bookings, VIP membership and loyalty programs and online sales,” said the factory’s Sebastian Mochkovsky. The Sacoa PlayCard system has found a home in a variety of operations, from larger FECs and amusement parks to smaller game rooms and laser tag centers. Sacoa is known throughout the amusement industry for offering “The Complete Solution” to control and manage all aspects of a family entertainment business. In addition to its Wireless Game Controller Kits for games and attractions, Sacoa provides a debit card system that allows the use of e-tickets, timecards, hyper-passports, multiple pricing tables, customer roaming service and many other features. For point of sale, Sacoa offers inventory tracking, remote kitchen printing and running tabs capability, plus self-service kiosks for game card sale, recharge and analysis (cash and credit card acceptance). Sacoa’s latest innovations include the Online Party Booking module that provides everything to manage party reservations including multi-store selection, availability, party packages, food, gifts and online payment. Moreover, its Online Sales module enables guests to instantly recharge cards from a location’s website. Both packages integrate seamlessly with the Guest Registration module, which gives locations the chance to capture critical marketing data from guests when they register cards with the PlayCard system. • They operate their own FECs and develop products in-house with a true inside knowledge of an operator’s business and marketing needs. • They pride themselves on outstanding performance and reliability as well as post-sale service and flexibility for product customization. • The PlayCard system has been in use for more than 20 years in locations around the globe. • They remain dedicated to support and customer service, offering a 24/7 Help desk at no extra cost and free software upgrades. Sacoa is currently preparing to launch the new mPOS, a mobile version of the Sacoa POS which can run in any Android tablet and, just like the full-blown POS, sell food and beverage or retail merchandise as well as PlayCards. It accepts cash, credit cards or PlayCard credit as payment, and can connect to a printer through Bluetooth for receipt printing.